TV displays mounted in your vehicle can entertain passengers while you travel short distances across town or long distances across the country, allowing them to play games, watch movies, or even view satellite TV with the appropriate equipment. When purchasing a TV for your vehicle, you must determine the correct display size for optimum viewing. When choosing the display size that you want, keep in mind its location and make sure it fits into the space available. The location of the display will determine what TV size you can get. 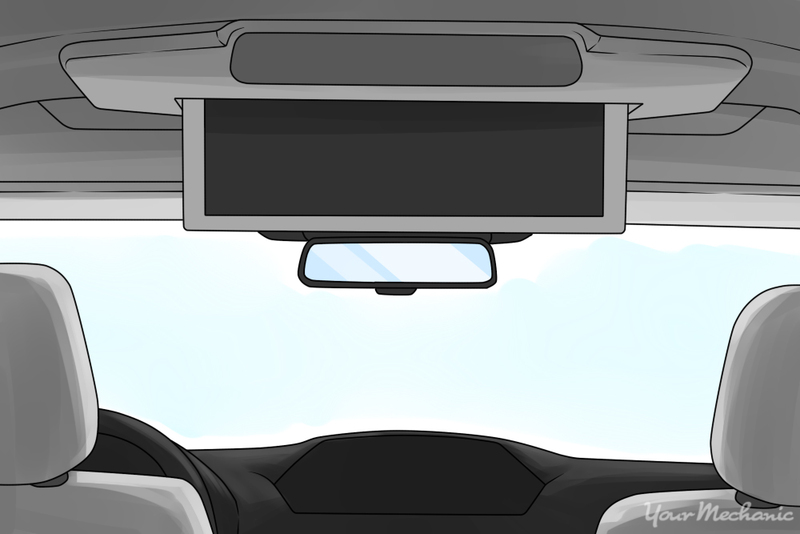 Some popular locations to mount the display inside your vehicle include in the back of the front seat headrests, mounted to the ceiling of the car, in the sun visors, and in the dash. If installed in the dash or sun visor, driver's need to make sure not to get distracted by the TV. Warning: In-dash monitors are not recommended, as they can distract the driver of the vehicle. You should limit in-dash equipment to GPS units, radio displays, and other monitors associated with the working of the vehicle. 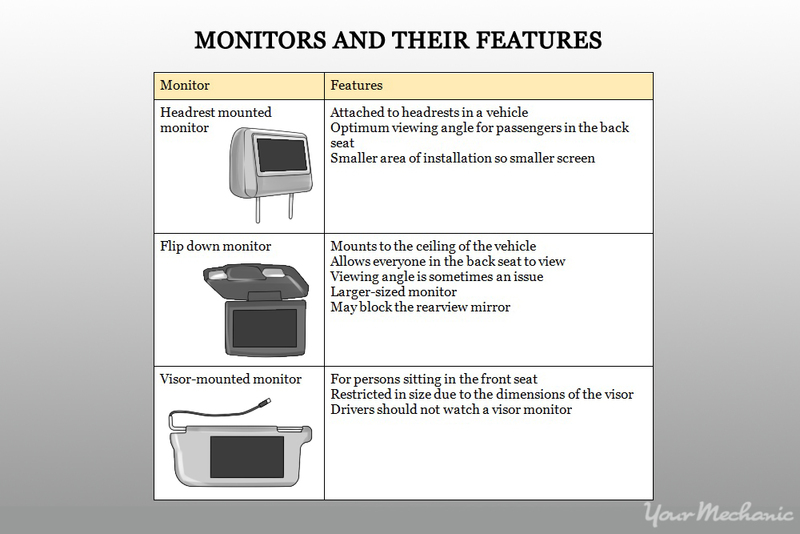 Regardless of the type of monitor installed, drivers should pay attention to the road while driving and not the monitor in order to avoid having an accident. Once you have determined the type of display you want to install in your vehicle, measure for the correct size. This requires you to tape out the area where you plan on installing the display and then measuring to get the screen size needed. Step 1: Tape out the area. Using masking tape, mark off the area where you want to install the TV. When marking the area, remember to take into account the width of the TV frame. On newer, lightweight models, the frame is generally smaller, so it's not that big of an issue. When installing a flip-down display, instead of marking out where you expect to install the screen, mark out where you expect to place the bracket. Tip: When installing a flip-down display, take into account head clearance. A correctly sized display should allow passengers to enter and exit the vehicle safely without bumping their heads. Flip-down displays are usually the same size as the brackets they are attached to. Step 2: Measure the screen area. After marking off the area where you expect to install the display, measure it to get the size of screen you need. 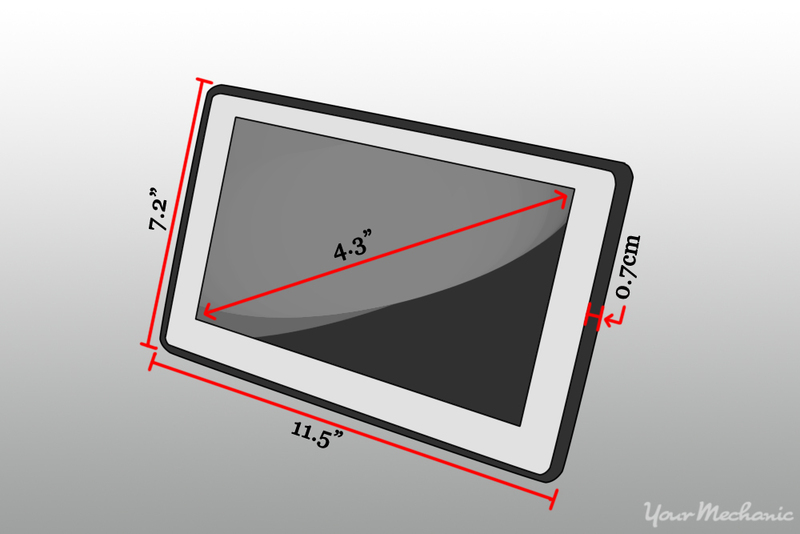 When measuring for screen size, do so on the diagonal, or from one corner to the opposite corner. This should get you close to the correct size you need. Step 3: Check with the installers. Before buying a display, make sure to check with the installation company who you plan to use to customize your vehicle. The installers should know if the display you have chosen fits in the space allotted. They can also tell you if any factors, such as the size of the frame or mounting bracket, will cause problems when it comes to installing the display. After you find the display size you want and know where to place it, it is time to purchase your screen. When purchasing a display, you can choose from a few options, including buying it online, at a local retailer, and by looking at what is available in the classified ads of your local paper. Step 1: Search online. You can search websites online to find the display you want. Some great websites to visit include Best Buy, Crutchfield, and eBay, among other sites. Step 2: Check out local retailers. 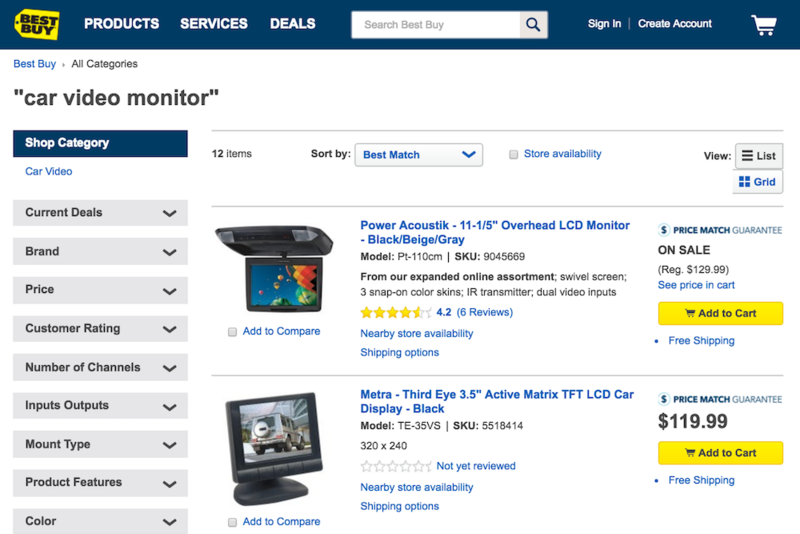 In addition to shopping online, you can also check out retailers in your area for car video monitors. Popular retailers include Walmart, Fry's, and Best Buy. Step 3: Look at classifieds in the local paper. Another place to find car video monitors is to look in the classified section of your local paper. When meeting someone from a classified ad to pick up an item you bought, make sure to meet in a public area or have a friend or relative accompany you. If possible, check to see that the item works before finalizing the deal. Installing a monitor in your car is a great way to add to the entertainment value of your passengers, making both long and short trips enjoyable and fun for all. If you have any questions about installing a car video display, feel free to Ask a Mechanic to get some useful advice on the process. Q: Is it possible to replace the standard Dimension Stereo in a Non Nav Limited with the Navigation system? Q: My car has entertainment system, current DVD player is not accepting USB devices. Can I change DVD player which takes USB device?